Happy Monday! We had quite the whirlwind weekend. We attended the Great Lakes Burning River Fest on Friday evening. It was my first time attending, so I didn't know what to expect. What I experienced were great views of Downtown Cleveland and Lake Erie from the Coast Guard Station, cold and delicious local craft brews from Great Lakes Brewing Co., live music, and food and demos from some of my favorite chefs and food trucks in town. Of course, my favorite parts of the event included the food. We had a great time watching the chef demos, including Jeff Jarrett from Sterle's and the Hub 55 Project. I also snagged a Lobster Roll and Tater Tots from The Beachcomber food truck. For just $12 pre-sale or $15 at the door, this event is affordable, fun, and in such a unique setting. Proceeds benefit the Burning River Foundation. Since 2007, they've awarded almost $400,000 to non-profit organizations dedicated to improving and celebrating our fresh water resource. On Saturday, we had quite the special night. Back in May, Mr. H won an auction package for a private dinner party for 8 people on the Observation Deck of the Terminal Tower, catered by our buddy Chef John Selick from UH Ahuja Medical Center. The food, company, and setting matched the breathtaking views from up there. It was my first time on the Observation Deck. We decided to stay the night in Downtown, grabbing a room at the Westin, because we had tickets to the Indians game on Sunday afternoon. It was quite a fun "staycation" weekend in Downtown, other than losing some money at the Casino, haha. How was your weekend? Let's make your Monday brighter by announcing the winner of the two tickets to The Ulimate BBQ Throwdown at Sterle's on September 12th. The winner is...Jason Tjoarman. Congratulations! Please check your email and reply by Wednesday, or another winner will be selected. If you didn't win, you can purchase your tickets online here for just $35. That includes 3 meats, 3 sides, and your first beer. Disclosure: I was provided with passes to the Burning River Fest to attend and give away, and two tickets to the BBQ Throwdown to give away. All opinions stated are 100% my own. Taking place under a decorated tent on the grounds of the prestigious Chagrin Valley Hunt Club Polo Field in Gates Mills on Saturday, September 19th, guests at the 5th Annual Chefs Unbridled will enjoy cocktails and appetizers while sampling cuisine from various stations around the tent from 7-9:30PM. Food trucks will be on site serving microbrews, cupcakes, and more, including the Hodge Podge Truck, voted best food truck in Cleveland. In addition to the great cuisine, guests can enjoy horse-drawn carriage rides throughout the grounds and participate in the silent and live auctions while listening to the sounds of strolling musicians. The event benefits the Fieldstone Farm Therapeutic Riding Center. In case you aren’t familiar, Fieldstone Farm Therapeutic Riding Center (located in Bainbridge) is one of the largest therapeutic riding centers in the country, serving 800 students annually (from preschoolers to veterans). Through a special partnership with horses, Fieldstone offers programs designed by professionals to foster personal growth and individual achievement for people with special needs. Tickets are $140 each, and they are still available. I hope to see you there! Disclosure: I was provided with two general admission tickets in exchange for this post. All opinions stated are 100% my own. I had to travel to Indianapolis for work, and we found ourselves on the road near Dayton at dinner time. I haven't been to Dayton before, and we knew that we didn't want fast food, so after a quick text exchange with a good friend that used to live in the area...we found ourselves pulling up to Thai 9. From the exterior, I thought that we'd find your typical hole-in-the-wall Thai restaurant with outdated decor and authentic smells wafting from the nearby kitchen. What we found was a spacious and inviting restaurant with multiple dining rooms, and a charming patio. They have an extensive menu, almost overwhelming, full of sushi and Thai dishes. We did a little bit of both. Mr. H had their Surprise Roll, where you let the chef select a roll for you. It was good, but nothing surprising. It was a tempura white fish with spicy mayo and fresh avocado. I think he was hoping for something a little more adventuresome, but apparently this is the roll that they always serve when someone orders the Surprise. Go ahead and pass on this, and just order your own. I was craving some Massaman Curry, and this version was quite good! They have a spice scale of 1-9, with 9 typically being "Thai hot." However, the chilies that they were currently using were so spicy that a 6 was considered Thai hot. My mom went with a 3, and I did a 6. It certainly was quite spicy, but just how I like it! It was a great find in the historic Oregon District of Dayton, and only 20 minutes out of our way. If you find yourself in Dayton, or passing through that area during lunch or dinner, I recommend visiting Thai 9. Steady Rollin'. This new release will be available for the first time at next weekend's Burning River Fest. The Session IPA will be a year-round beer. Its light-body and fruit flavors made this the easiest sipping IPA that I've tried in a while. A handful of bloggers were able to get an exclusive preview of this new release at the Beer Symposium at Great Lakes Brewing Co. in Ohio City. Originally home of the historic Fries & Scheule’s department store, that building acted as their production brewery throughout the mid-1990s. Just around the corner from the brewpub, its first floor now acts as the visitors center and features displays showcasing GLBC history and company culture. With its own bar and state-of-the-art audio-visual equipment, this room is ideal for meetings or smaller gatherings. We were treated to Great Lakes' beers, some tasty appetizers, a tour of the brewery, and a session with GLBC founder Pat Conway himself. Proceeds from the upcoming Great Lakes Burning River Fest benefit the Burning River Foundation, a local non-profit organization that provides resources for the sustainable future of our waterways, which has donated almost $400,000 to date. Pat's passion for improving, maintaining and celebrating the vitality of our regional freshwater resources is infectious. I could have sat there and listened to him speak for hours. The whole crew at Great Lakes is very passionate about their business, and this festival. 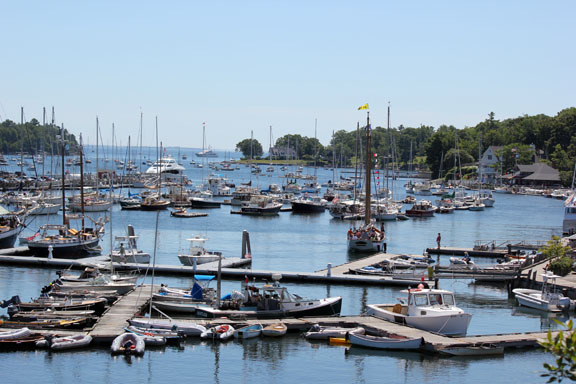 Taking place on Friday, August 28th and Saturday, August 29th, the Great Lakes Burning River Fest features Great Lakes beers, food from local vendors, chef demos, live music, and a historic and picturesque setting at the Coast Guard Station. Pre-sale tickets for Burning River Fest are now available for just $12! All pre-sale tickets include a FREE yoga class taught by the amazing Balance & Brews yoga group. Ticket prices will increase on August 24th to $15. Or, you can win two General Admission passes here. Just use the Rafflecopter form below for ways to enter the random ticket giveaway. I will select a winner on Tuesday, August 25th. Enjoy a celebratory evening at one of Cleveland's best kept secrets, while helping Northeast Ohio be recognized as an environmental leader that is dedicated to the sustainability of its high quality freshwater resources. Disclosure: I was invited to attend a preview of Burning River Fest, and was provided with samples. I was provided with four tickets in exchange for this post and an event recap, two to attend and two to give away. All opinions stated are 100% my own. Cleveland restaurateur Zack Bruell's new Alley Cat Oyster Bar has opened as part of The Flats Project on the east bank. Right across from Shooter's and The Music Box Supper Club, diners can enjoy views of the Cuyahoga River that have been hard to find in the past. Finally, some waterside dining with food to match the quality of view! The menu features 12 types of oysters. Currently, they are offering three a night, until they get to know the menu better. We indulged in the three available that evening. Other than the fact that a few of them hadn't been detached from the shell, we really enjoyed them. We also ordered the Beef Tartar with egg 63, house grain mustard, and toast points ($15). It was a good tartar, but Greenhouse Tavern and Luca both have better versions. I'd try other starters before ordering this again. I convinced Mr. H to share entrees with me, so that we could try more than just the Lobster Roll ($22). What can I say, we're on a total lobster roll kick after our trip to Maine. My mom, also a lobster lover, was also ordering the roll, so I just had to try something else too. This was a far cry from what we were able to get in Maine, but it was probably the best version that I've personally had in the Greater Cleveland area. I was concerned that it was dressed with Green Goddess (I'm a lobster purist! ), but the dressing was light and it didn't detract from the butter-poached lobster. 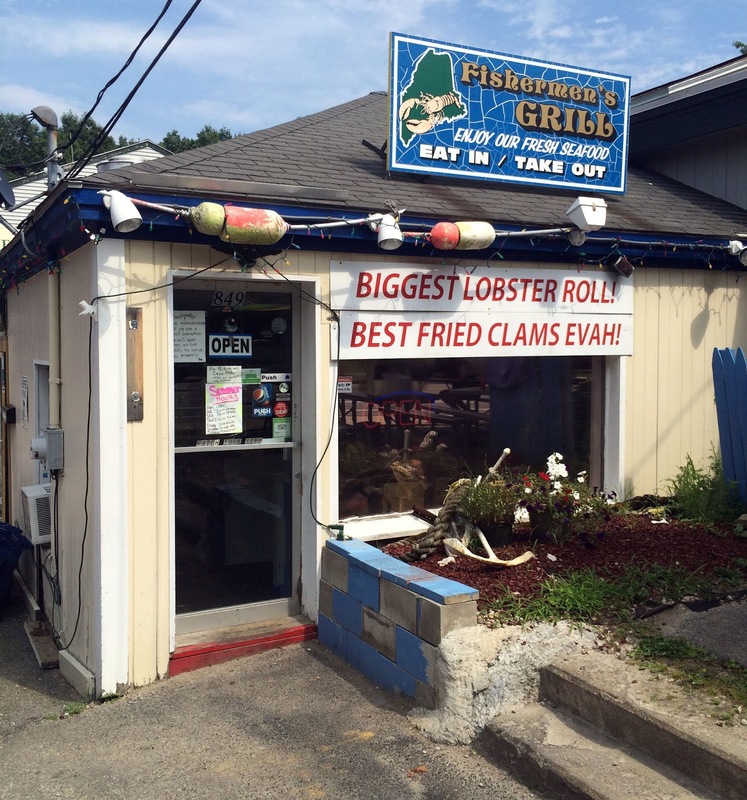 For the price, I'd like to see more lobster on the roll. The fries were quite good! Extra crispy, and lightly seasoned. We also shared the American Red Snapper with an arugula bread salad ($21). The fish was cooked perfectly, and the flavors were light and summery. Enjoyable, but not memorable, however. Service left a lot to be desired. It was much sloppier and more casual than other Bruell restaurants, and the staff seemed very uneducated on the menu. Like, we were served bread that had kernels of corn in it, but no one could tell us what the type of bread was. I've been to other Bruell restaurants close to opening, and that was never the case before. I think management is aware of the issues, and they are addressing them, so I expect that things will be running more smoothly next time we're in. Because, we'll certainly be back! This is what Cleveland needed. More quality seafood options, excellent cocktails, and waterfront dining. It's so exciting to see the progress being made in The Flats. Have you been down there recently? Bomba Tacos and Rum opened in Rocky River recently. From the same folks behind the popular Paladar Latin Kitchen, people have flocked to this casual premium taco restaurant. The wait can get a tad long, and they don't take reservations, so be prepared. However, I suggest grabbing yourself a Pomegranate Ginger Mojito while you wait. The focus of the menu are tacos and shareable snacks, but they do have a build-your-own guacamole section, house made salsas, three salads, four large plates, five sandwiches, and sides. Judging from the amount of families that we saw dining there, I'd say that this is a kid-friendly spot despite having "rum" in its name. I'd love to see some suggested combinations for the build-your-own guacamole ($5.50 + additional toppings). It was a little overwhelming to choose when we were put on the spot by our server, but she made a suggestion of bacon, goat cheese, and black beans, so we went with it. The guacamole is served with yucca, plantain, malanga, and corn chips. Having the variety was something different, and enjoyed. It was good, but Momocho does it better. They suggest 3-4 tacos per person. I decided on the Roasted Pork Al Pastor (left), Chorizo and Potato (center) and Crispy Shrimp (right). They are $3 - $4 each. The Crispy Shrimp, with jalapeno, mango, and a roasted garlic aioli was my favorite. They were all quite messy, as a taco should be, but the tray was helpful in keeping the mess contained. I also appreciated that extra napkins are stashed at each table. I can't help but compare Bomba to local favorite, Barrio. I'd say that Barrio's tacos are a tad better, and I love the build-your-own system that they use. I'd like to see Bomba offer at least a small section of create-your-own tacos. My friend asked if she could leave the roasted red peppers off one of the tacos she wanted, and our server was hesitant to ask the kitchen. The answer ended up being no, so she had to order a different one. Judging from the line out the door when we left at 7:30, this restaurant will probably do well in Rocky River. Our first weekend back in Ohio was a busy one. 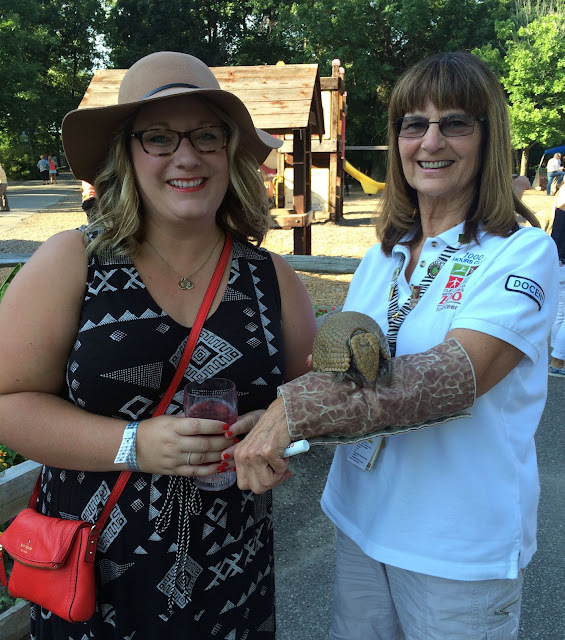 The first full weekend in August always brings one of my favorite summer events, Twilight at the Zoo. This 21+ event features live bands, bars, and buffets scattered throughout the zoo grounds for an evening of strolling, interacting with the animals, and enjoying a summer night at its finest. This year, we sprung for VIP, and I'd highly recommend it. Yup, that's me with an armadillo and a cocktail. Not a bad way to spend a summer evening in Cleveland. On Sunday, Mr. H and I headed to Akron for the National Hamburger Festival. It sounds a little more official than it really is, but it was a nice, small street festival honoring the American tradition of hamburgers. We stuffed our faces with Cheeseburger Pierogi from The Pierogi Lady, two styles of burgers from Smoke the Burger Joint, and one from Max and Erma's. I didn't care for the pierogi at all (bland, no noticeable cheese), and the BBQ and bacon burger from Max and Erma's was only average at best (top right). But, we both really liked the Dirty Vegas with balsamic mayo, spinach, cheddar, bacon, caramelized onions and a fried egg from Smoke (bottom right). I also enjoyed the creamy, cheesy toppings on The Gilroy 5 Cheese Burger from Smoke (bottom left). Their burgers had good flavor, were cooked to medium rare, and the buns held the messy toppings in as best they could. They even cut them in half, because they knew some sharing was going on. That was appreciated. The festival is just $10 to get in, and it was a great way to try restaurants that are outside of the Cleveland area. We also just enjoyed walking around on a sunny day, taking in Lock 3 in Akron. Sunshine, cold drinks, people-watching, live music, and a belly full of cheeseburgers. There are worse ways to spend a Sunday. Look out for this festival next year! Nothing to disclose here. This post was not sponsored, and I have no affiliation in any way. Mr. H and I just escaped for a four-day weekend in Maine. He had stumbled upon an article on Yahoo a few months ago about "10 Themed Festivals that you should do before you die." 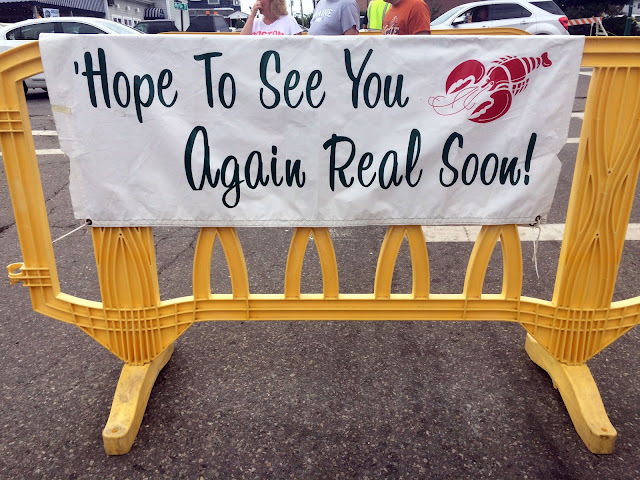 One of them was the annual Maine Lobster Festival in Rockland, Maine. 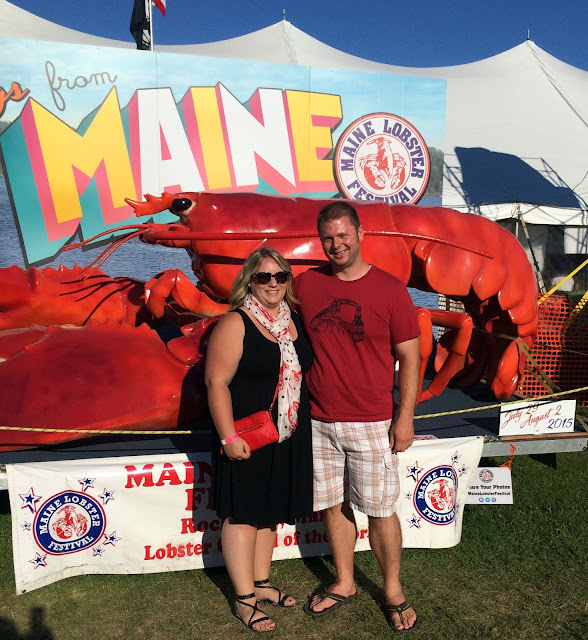 Both huge seafood lovers, and Maine on our travel bucket list, we decided right then and there to book the trip. 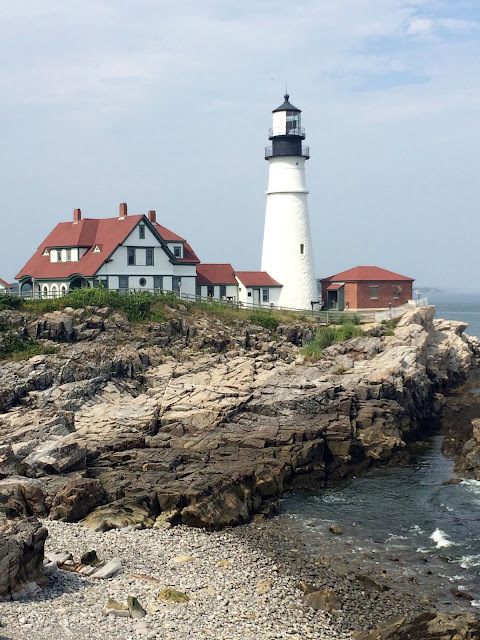 We flew into Boston, rented a car, and drove up to Portland, Maine. We stayed there for two days, feasting on memorable meals at Fore Street and Eventide Oyster Company. The Eventide Lobster Roll with brown butter vinaigrette on a steamed bun quickly became one of the best bites of food that I've had in my life. And, let's face it, I've had A LOT of good food in my life. Seriously, if you find yourself in Portland, don't miss this. I soaked up the smell of sea in the air, and gorged myself with lobster and oysters at almost every meal. 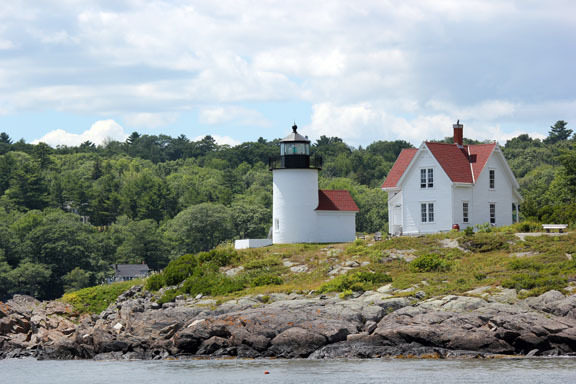 We also did some shopping, picking up some Maine treats to use in the kitchen, and took a tour on the Downeast Duck Adventures to get a lay of the land and Portland's history. 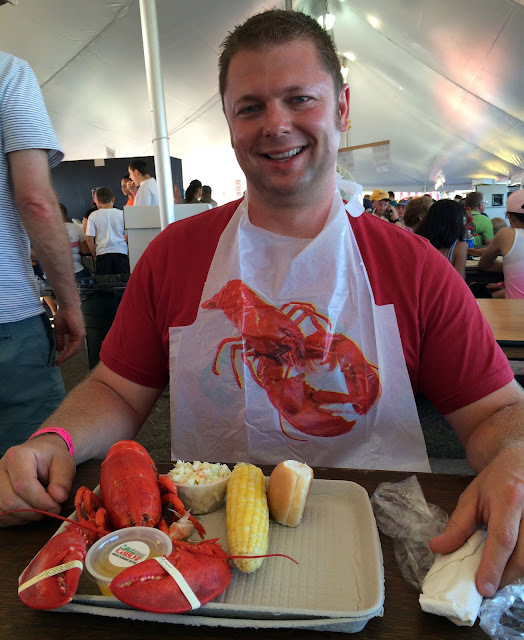 I thought that I may actually TURN INTO a lobster roll at one point, but, boy was I happy. My favorite was from the Fisherman's Grill on the side of the road in Portland. I didn't even know that there are multiple kinds of lobster rolls. It's decided, we both prefer the "Connecticut-style" when the lobster is warmed and in butter instead of chilled with mayo. After two days in Portland, we headed up the coast to Camden. Friday evening, and it was time to get to the Festival. $16 got you a full lobster, ear of corn, roll, and butter for dipping. It's soft-shell lobster season, which means that they can't ship them. Hence the timing of the annual festival. 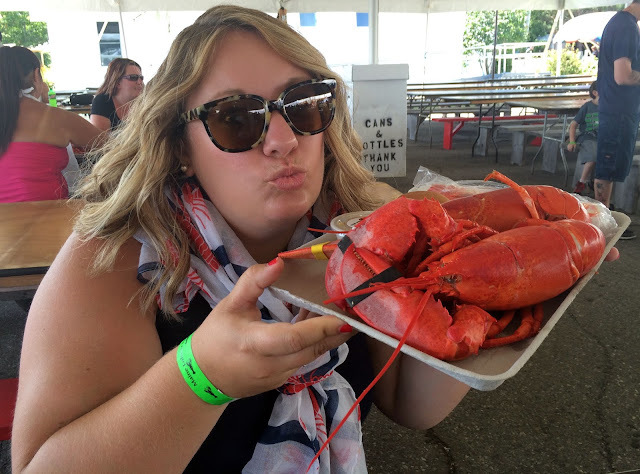 You could literally crack open the lobster claws and tail with your bare hands. We had a wonderful time feasting on whole lobsters that evening, but we hadn't had enough. Another day, another lobster t-shirt for Mr. H and a another lobster scarf for me. We took this theme seriously. We came back the next morning for the Parade, and lunch at the festival. That evening, our last in Maine, we dined at Primo Restaurant in Rockland. I was surprised that this little town had a James Beard award-winning restaurant, but I guess that just goes to show you that excellent food has no boundaries. We got on the road early the next morning to head back to Boston. From Camden, it was about a three and a half hour drive. We got to spend most of the day in Boston, taking a tour and visiting the New England Aquarium. You can take the girl out of the East Coast, but you can't take the East Coast out of the girl. The smells, sights, history, and food felt like "home" and I loved every minute of it. Cleveland may have my heart now, but I left a piece of it in Maine.